Whether you’re an artist looking to show off your work or a freelance professional wanting to advertise your services, the .name domain is the perfect option for you. Instead of getting lost in a sea of traditional .com websites, you can set your digital space apart by adding a personal touch to your web address. The .name domain was first introduced in 2001. It’s a generic top-level domain name, so it’s open to anyone who wants to take advantage of all the benefits it offers. Originally, the domain was established for individuals wanting to use their own name or screen name in their URL. It’s a personal domain that stands out no matter what type of content you’re hosting. The .name domain extension is all about showing off who you are as an individual. Even if you’re part of a larger corporation, you can create your own website to increase your own Internet visibility. These days, having an established Internet presence is important, regardless of the industry you’re in. A .name domain allows you to do just that. It’s an ideal option for bloggers, artistic individuals, and working professionals. Bloggers can use it as a form of advertisement to attract followers. Artists can utilize the domain for their own portfolio. It’s easy to remember, allowing you to share your URL with people in the real world. If you’re a working professional, the domain can be great for hosting your resume. One of the great things about the .name extension is that it’s relatively easy to register your desired domain. If you’re using your own name, there’s no need to worry about trademark issues or cybersquatting. People have been using the .name domain creatively since its launch. The simplest way to use it is with your very own name. Something like JohnDoe.name is unique enough to set your website apart. Those web users who are actively searching for your website will instantly recognize your name and click. For this same reason, the domain is also a great choice for email addresses. If you want to get extra creative, you can adopt second and third-level domains. For example, you can use something like Jane.Doe.name. Where Can You Buy a .name Domain Extension? Registering the .name domain couldn’t be easier. It’s offered by some of the most popular registrars out there. 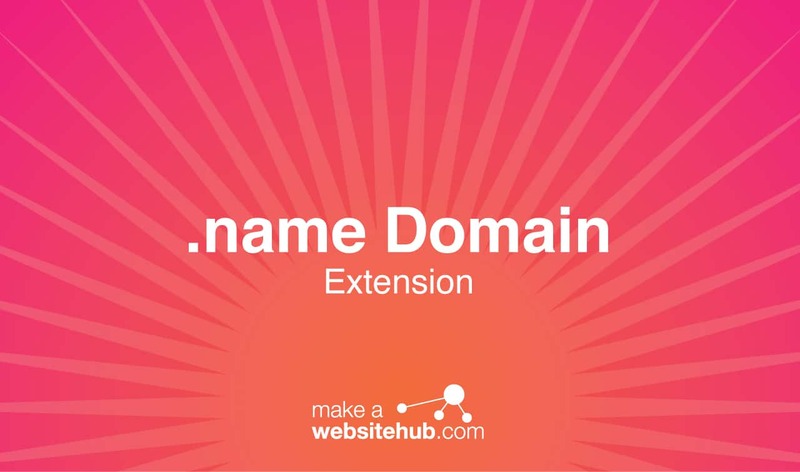 While the domain is in high demand, the extension comes with a relatively affordable price. It has no use restrictions and can be registered for up to 10 years at a time. Here are some registrars that you can check out to see if your .name domain is available.